Android gaming has come a long way, but the desire to add buttons to touch-focused mobile devices has never quite gone away. Enter the Archos GamePad, a Jelly Bean tablet with 14 buttons and two analog thumb-sticks - a layout similar to an Xbox 360 or PlayStation 3 controller. 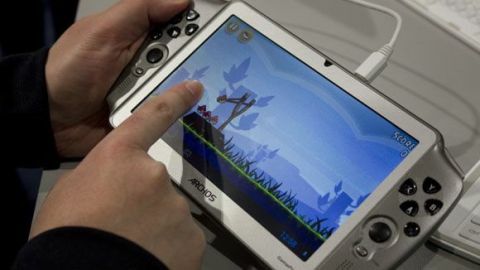 Archos had the GamePad on hand at CES to try out, and we at TechRadar decided to take it for a spin, testing games like Angry Birds, Dead Trigger and Trials Xtreme 2 on the gaming tablet. We found that the GamePad has a few crucial shortcomings, though it makes up for them in some creative ways. The Archos GamePad looks great on paper; with Android 4.1 Jelly Bean, a 1.6GHz dual-core processor, a quad-core GPU, 8GB of storage with room for a microSD, and a mini-HDMI port, it's equipped with everything it should need to be successful. But the GamePad's most important feature is its buttons - having physical inputs should in theory improve the gaming experience immensely over a pure touch interface - and unfortunately the Archo GamePad's buttons and control nubs leave something to be desired. The buttons themselves are clicky and responsive, and the left and right shoulder buttons/triggers feel like the triggers on Sony's PS Vita, which certainly isn't a bad thing. But the analog thumb-sticks could have been ripped straight off of Sony's older PSP, and that is a bad thing. They offered far too much resistance, making it difficult to control the first-person zombie shooter Dead Trigger. Nintendo and Sony's latest handhelds - the 3DS and PS Vita, respectively - each offer far superior analog control options, and they've both been out for more than a year, so there's no excuse for these outdated nubs. Input issues aside, the Archos GamePad suffers from another issue that plagues many mobile devices that attempt to offer physical control solutions: a lack of standardization. Suffice it to say the buttons don't always work with each game the way you might expect. On the other hand, Archos has come up with a flexible solution for this by allowing users to map the GamePad's physical buttons to any point on the screen. Using a simple interface, players can drag icons for the buttons and analog nubs anywhere on the screen so that when those inputs are used, that part of the screen is activated as if you'd touched it. It's a versatile tool, but it still feels like little more than a workaround for a system and games that were never meant to have these inputs in the first place. Elsewhere, certain functions of the OS simply don't work correctly, though this is probably more an issue with Jelly Bean itself or even some specific applications. For example, pressing the back button on the system bar at the bottom of the screen unpaused Dead Trigger, but the in-game pause menu remained open, leaving the game obscured while the zombies had a feast. Elsewhere, when the tablet was flipped from landscape to portrait orientation, the position of text in the GamePad's own settings menu got pushed off the screen instead of adjusting to fit. Aesthetically, the GamePad more closely resembles some outdated piece of retro computer hardware than a sleek, modern Android tablet, and the headphone jack sits awkwardly on the top of the device (though it is pleasantly light and thin). These flaws are symptoms of the Archos GamePad's general lack of cohesion, which unfortunately holds the tablet back from being as great as it could be. But those desperate for physical controls on an Android tablet could likely do worse, especially at the Archos GamePad's affordable $169 price point.